The physical properties of density and strength of concrete are determined, in part, by the proportions of the three key ingredients, water, cement, and aggregate. You have your choice of proportioning ingredients by volume or by weight. Proportioning by volume is less accurate, however due to the time constraints of a class time period this may be the preferred method. A basic mixture of mortar can be made using the volume proportions of 1 water : 2 cement : 3 sand. Most of the student activities can be conducted using this basic mixture. Another “old rule of thumb” for mixing concrete is 1 cement : 2 sand : 3 gravel by volume. The strength properties of the concrete are inversely proportional to the water/cement ratio. Basically this means the more water you use to mix the concrete (very fluid) the weaker the concrete mix. The less water you use to mix the concrete (somewhat dry but workable) the stronger the concrete mix. Remember that water is the key ingredient. The strength of the concrete mix is the ration upon which the cement, sand, stones or aggregates are amalgamated. Depending on these ratios, different types of concrete grades are accessible in the market. 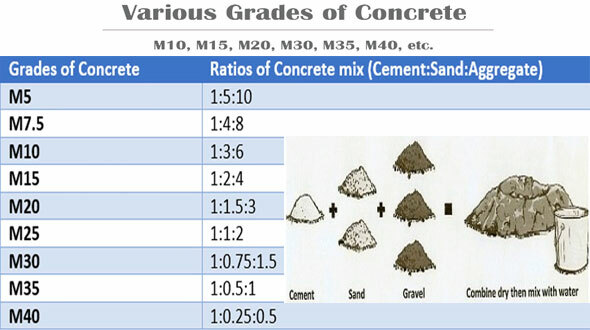 Concrete grades range from M10, M20, M30, M35, etc. “M” denotes “mix”. Mix characterizes concrete with indicated ratios of cement, sand and aggregate. And the number after “M” denotes compressive strength of that concrete mix in N/mm2 after 28 days. As for instance, for M30 grade of concrete mix, its compressive strength after 28 days should have been 30 N/mm2. These concrete mixture ratios are designed for the concrete to reach full strength at or around 28 days. Curing the concrete can be done by keeping it wet after the first day until the concrete is 7 days old. This is an important step to take for the concrete to achieve full strength by 28 days. We will give you below the standard chart table. On the chart table are presented different grades of concrete mix design with their relevant ratios of cement, sand and aggregates required.